Key collaborators from left: The Bail Project member Daryl McAdoo, DPD Meredith Galen, The Bail Project member Shameka Parrish-Wright, Head Deputy Jane Newman, The Bail Project CEO Robin Steinberg, Deputy-in-Charge Sharonda Bradford and DPD Alisa Blair. Joey had been in and out of the juvenile system since age 13 — the year his mother died of pneumonia and he was shuffled around before entering foster care. Things got worse when Joey’s older brother was shot and killed in a drive-by. At 19, Joey (not his real name) was assigned a public defender in Compton after being accused of residential burglary. That’s when UCLA law students Delaram Kamalpour and Kelsey Atkinson joined the effort to persuade the judge that Joey was not a flight risk and should not languish in jail on bail. 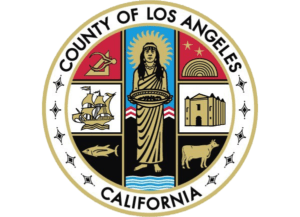 In a pilot project, the LA County Public Defender’s Office in Compton is collaborating with The Bail Project and UCLA Law School to lower the bail and secure the pretrial release of as many clients as possible. Ten UCLA students are working with Compton public defenders to prepare and present bail hearings this fall. The students are certified law clerks who are able to argue on the record. Launched a decade ago in the Bronx, The Bail Project combats mass incarceration at the front end by paying bail for tens of thousands of low-income Americans at risk of pretrial detention. The Bail Project’s CEO Robin Steinberg recalled making a presentation about her group’s mission to the LA County Public Defender’s Office. Since September, the Public Defender and UCLA law students’ team have won 10 of 12 bail hearings in Compton. Each day, hundreds of thousands of legally innocent people languish in jails simply because they can’t afford bail. Bail amounts vary widely, with California leading the nation with the highest amounts. So the poor suffer. Even the lower amounts are more than many can pay, and they will spend time in jail for lack of as little as $500 or even $250. As people await court hearings behind bars, sometimes for years, they suffer from inadequate medical care and dangerous conditions, and many lose their jobs and housing. They also are more likely to take plea bargains just to get out of jail, whether or not they actually committed a crime. With the signing of the California Bail Reform Act (SB 10) in August, California became the first state to fully abolish cash bail. But the law, which takes effect in October 2019, has been highly criticized by many human rights groups as giving the courts too much power. The law replaces cash bail with a statewide system of risk assessments (computerized algorithms that supposedly predict human behavior) while expanding probation departments and giving judges extremely broad discretion to detain people — not on bail, but without any hope of release at all. Algorithms don’t look at clients as human beings, Newman said. But she hoped that SB10 may become a catalyst for a culture change in the system. Her collaboration is meant to accelerate that change. “We did a hearing last week in Compton, and the UCLA students did a tremendous job humanizing our client,” Newman said. “The judge didn’t even take two seconds and said, ‘OK I’ll drop bail from $50,000 to $25,000.’ And I think she thought she was doing us a favor, but $25,000 is a no-bail hold for our client. One of the collaboration’s successful bail hearings was Joey’s case. Proving to the judge that Joey was not a flight risk was challenging, Kamalpour said. Judges consider the client’s ties to the community, ties to their families and jobs, but Joey had none of these ties. So the group secured for Joey a residential drug treatment program in Venice, which persuaded the judge that he was not a flight risk. “The judge gave him conditional release on his own recognizance,” Kamalpour said. “The condition was that he be released to the hands of Phoenix House. That was a month ago. He is still there and has returned to court. He’s successfully going through the program. 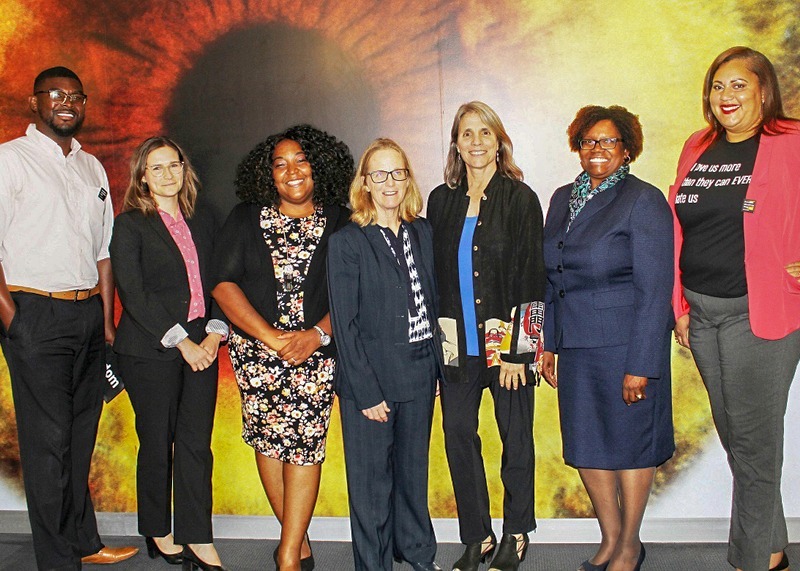 1) Key collaborators from left: The Bail Project member Daryl McAdoo, DPD Meredith Galen, The Bail Project member Shameka Parrish-Wright, Head Deputy Jane Newman, The Bail Project CEO Robin Steinberg, Deputy-in-Charge Sharonda Bradford and DPD Alisa Blair. 2) UCLA law students Delaram Kamalpour and Kelsey Atkinson make their case during a bail hearing inside the Compton Courthouse. 3) Newman is interviewed by USC Annenberg student Marmarah Similien about bail reform and the Compton collaboration for Match Volume, a podcast production of USC Annenberg Media. 4) Head Deputy Jane Newman speaks during a panel discussion on bail reform and the bail collaboration held in Beverly Hills sponsored by the Bail Project, while The Bail Project members Shameka Parrish-Wright and Dolores Canales listen. 5) Collaborators from left: Lillian Kalish (The Bail Project), Michael Nishimura (The Bail Project), Alicia Virani (Assoc. Director, Criminal Justice Program, UCLA Law School), Delaram Kalampour (UCLA law student), DPD Johan El-Farra, Ethan Van Buren (UCLA law student), Kelsey Atkinson (UCLA law student), Head Deputy Jane Newman.